Julia is available to teach Franklin Method and Embodied Anatomy workshops at your Pilates, yoga or dance studio, at health and wellness clinics, and to professional athletes. Groups usually range from five to thirty, and require space to move. Contact Julia to chat about which workshop best suits your needs. The Franklin Method has developed an approach to mental imagery that integrates science and art. The brain is truly in the cells of our body as well as our skulls, and DNITM accesses simple techniques to develop your skill as you work toward making change. In this workshop, we create a toolbox of mental imagery techniques and get started learning how to be our own agents for change. 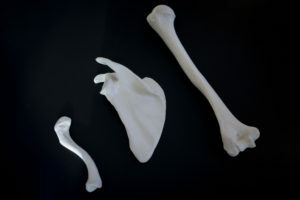 Note: this workshop is an excellent lead-in to any specific anatomical area workshop. 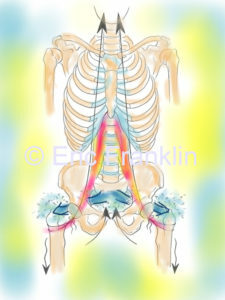 The pelvis area communicates with both the lower and upper body, and houses our centre. As such it is an excellent place to look to in order to create a better functioning body. This workshop can be presented in a two- or four-hour format. 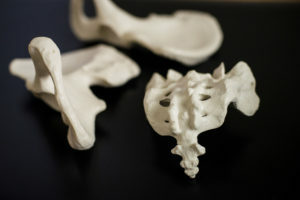 Learning encompasses embodiments and learning about the hip joint, the bone rhythms of the femur and pelvis halves, sacral nutation and counter nutation. 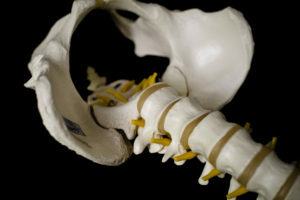 An in-depth workshop also looks at the layers of the pelvic floor musculature and with ball work, illuminates the connection between the pelvic floor, lower back, and good hip flexion and extension. Workshops will give participants tools to cue and/or practice good pelvic floor health. Expect “aha” moments as you feel the centre return to its natural rhythms, and reflect on current postural strategies that may be blocking these rhythms in both ourselves and our students. Note: A pelvic floor-specific workshop is available if desired! Shoulder tension anyone? Neck sore? 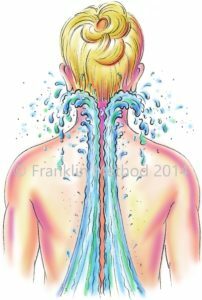 Our neck and shoulders are an emotional centre of the body and, as such, carry conscious and unconscious tension. This workshop is an easy two-hour exploration of imagery techniques for releasing long-held muscles and allowing the joints in the area to move more freely. We learn just enough about the three to eight joints involved to have a better understanding of optimal movement, and problem-solve common complaints. Alignment of the whole body is stressed, as is breath, so support can swell upwards from the floor and outward from our organs. In the four-hour workshop, we dive deeper into the joints of the shoulder. Again, the holistic approach puts an emphasis on our breathing and alignment, as two key areas that contribute to shoulder health. Clearing up our movement here and cueing (as a teacher) can save much aggravation and prevent injuries such as rotator cuff tears, bursitis, and even frozen shoulder. 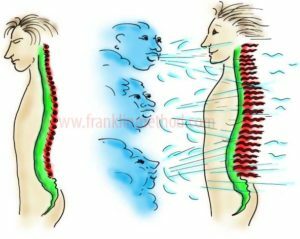 Experience overhead reach, push-ups, and pulling from the vantage point of the Franklin Bone Rhythms, in order to allow our musculature a better chance at leveraging power and ease. 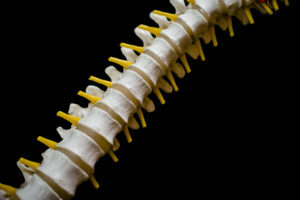 Your spine has many joints that crave movement and nourishment. Compression and de-compression, twisting, side bending, folding, and extending are the vitamins our spines need daily so that it can be the springy support we all want. We will look closer at the joints in the spine, embody commonly-held ideas about our “back”, and search for new words together to create a new culture around back imagery. We shouldn’t expect ourselves to fall apart. Our spines are built for life. 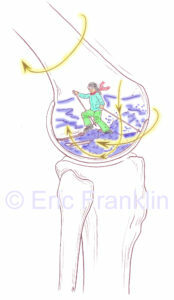 Learn the wonderful “Franklin Spine Dance” together for a joyous investigation of moving it all. Oh those knees! As the midway point of support between the foot and the hip, they take such a beating as the midway point of support between the foot and hip. 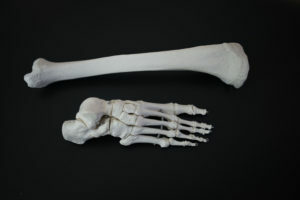 Imaging this very amazing joint can allow us to break bad habits and load those knees more wisely. We’ll pay some attention to the muscles that surround the joint, ligaments and menisci, and create buoyant knees for life. Our foot was born to have multiple planes of movement to make it the most adaptable, dynamic support for our body possible. Why then do we have so many foot problems in our culture? Keeping our feet comfortable and strong is absolutely key to aging well. Come along for an investigation of what is supposed to happen when we walk and stand, and what might be getting in our way. Learn ball and band work that helps to strengthen the foot (?) and rekindle the proprioception of long lost sensors and muscles. The psoas complex is often blamed for hip and lower back trouble, and yet it is really a powerhouse of core support and action. Made up of three muscles, the complex has a huge role to play in creating a supported lower back, walking well — and yes, in overall alignment. We will take an integrated approach to locating it, imaging it, and working it eccentrically. Learn the Franklin Method psoas ball conditioning routine and work with the bands to fire it up, followed by release exercises that give this emotional centre a break. Activate your calming parasympathetic nervous system by being in touch with your breath. Looking at the attachments of the diaphragm, we see how impactful a good breath can be to spine, rib cage, pelvic floor health and overall wellness. We will look at the biomechanics of a natural breath and the movements it creates in the body. 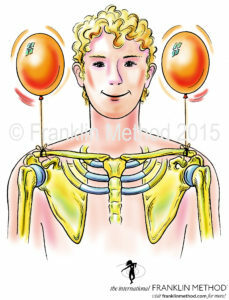 Then working directly with the diaphragm, we can shake, release and relax this huge muscle to free up our breathing. A tutorial on the relationship to the pelvic floor is included so we can get our inner core functioning well. We’ll talk about the cues we may have heard about breathing and discuss whether they are sound, based on what we know about how breathing really works. Julia shares her vast knowledge of the body and the Franklin Method work with specificity, positivity, and humour. While educating us in the Franklin Method, Julia’s encouragement to incorporate the work into our daily practice, wherever we are, is refreshing. It is empowering. It is simple. It reminds us that change is a breath away.